The recently-revived Minnesota Main Street Program will be holding a Launch Event this week. The announcement of the program roll-out is this Thursday, May 27th, 4:00 to 6:00 p.m., at the Main Street Theatre in Sauk Centre. The location for the announcement was chosen for two reasons. First, the theater is called the “Main Street”, its marquee was the basis for the Minnesota Main Street Program’s new logo, and, let’s face it, it’ll be a way cool backdrop for the photo op. 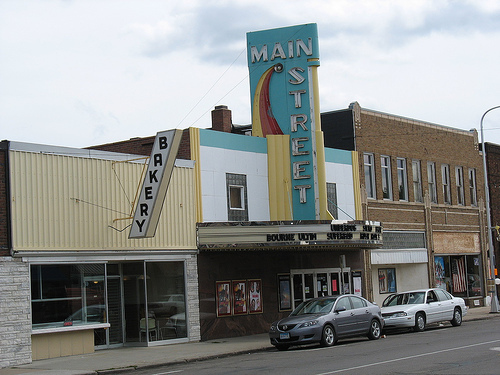 Second, and far more importantly, Sauk Centre is the setting of Minnesota writer Sinclair Lewis’ novel “Main Street”, which offers a cultural call-out to those often literary-minded historic preservation types. As I mentioned in a recent post, the NDDC (based from birth on the Main Street Program) has high hopes for the revival of the state program. With the many economic challenges threatening our historic commercial centers throughout Greater Minnesota, the program (which was created by the National Trust for Historic Preservation in 1977) returns at a critical time. The announcement includes presentations from Bonnie McDonald of the Preservation Alliance of Minnesota, Bill Morgan of St. Cloud State University, and Britta Bloomberg of the Minnesota Historical Society. Bob Douvier, owner of the Main Street Theatre, has graciously scheduled a free screening of “Elmer Gantry” at 6:00 p.m.
For more information, contact Emily Northey, Minnesota Main Street Program Coordinator at enorthey@mnpreservation.org.